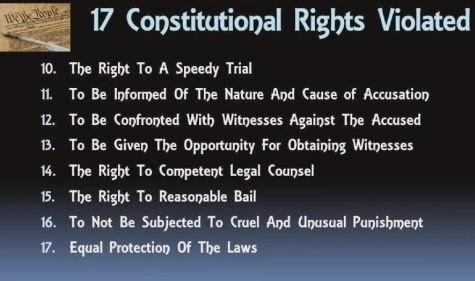 Here's a list of the 17 Constitutional Rights of Spencer C. Young that were trampled upon by woefully corrupt public officials in Durham (NC) County and Pinellas (FL) County, who viciously collaborated in his UNLAWFUL incarceration with the most violent of felons for 127 days on a bogus felony charge that was later dismissed as meritless. This BOGUS felony charge was literally concocted out of thin air by a corrupt Durham NC District Attorney (Leon Stanback) in collaboration with, and to UNLAWFULLY COVER-UP the felonies of his long-time friend and colleague David Q. LaBarre, who engaged in FIVE episodes of grand larceny along with Mr. LaBarre's girlfriend (Leah R. Krier). 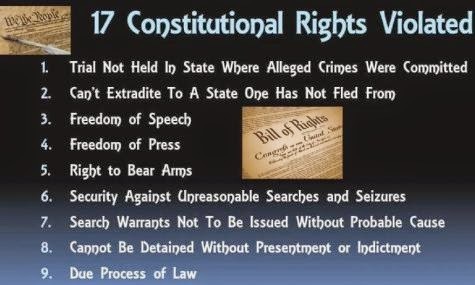 Details of these rights violations can be accessed by clicking here.